This analysis ran (or, more properly, was attempted) for a couple of weeks and failed a few times. The failures seemed to be linked to the external hard drive I was reading/writing data to. It continually locked up, leading to “Segmentation fault” errors. We’ve replaced the external with a different one in hopes that it’ll be able to handle the workload. Will be attempting to re-run Stacks with the new external hard drive. I’m posting the Jupyter notebook here for posterity. Received another set of Ostrea lurida genome assembly data from BGI. In this case, it’s data assembled from the small insert libraries they created for this project. Additionally, there’s a table breaking down the N50 distributions of scaffold and contig sizes. Data management stuff was performed in a Jupyter (iPython) notebook; see below. See Jupyter Notebook below for processing details. I decided to run a quick test to see what difference in speed (i.e. time) we might see between handling files that are stored locally, on an external hard drive (HDD), or on our server (Owl). This isn’t tightly controlled because it’s possible that other people were using resources on the server, thus slowing things down. However, this situation would be a true real world experience, so it is probably an accurate representation of what we’d experience on a daily basis. Attempting to get some sort of analysis of the Ostrea lurida GBS data from BGI, particularly since the last run at it using Stacks crashed (literally) and burned (not literally). Katherine Silliman at UIC recommended using PyRAD. I’ve taken the example Jupyter notebook from the PyRAD website and passed a subset of the 96 individuals through it. In this instance, the subset of individuals were all analyzed as a single population. I have another Jupyter notebook running on a different computer that will separate the three populations that are present in this subset. Additionally, I did run into an issue when I tried to visualize the data (using the *.vcf file generated) in IGV (see screen cap below). 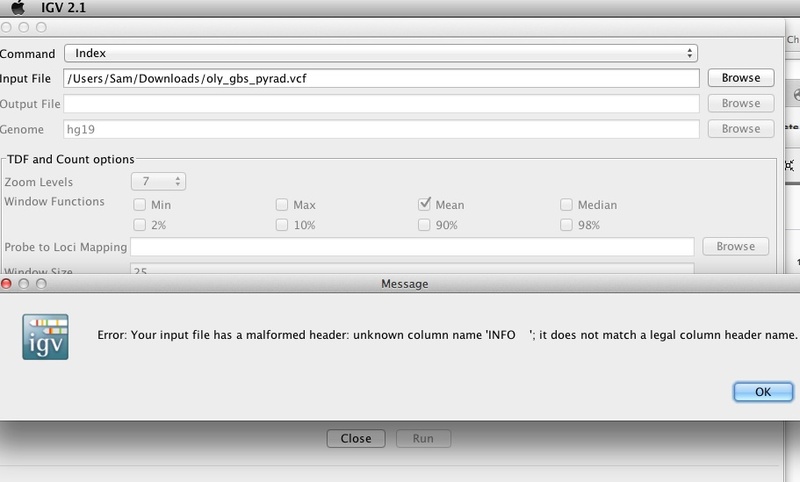 I’ve posted the issue to the pyrad GitHub repo in hopes of getting it resolved. One last thing. This might be obvious to most, but I discovered that trying to do all this computation over the network (via a mounted server share) is significantly slower than performing these operations on th efiles when they’re stored locally. Somewhere in the notebook you’ll notice that I copy all of the working directory from the server (Owl) to the local machine (Hummingbird). Things proceeded very quickly after doing that. Didn’t realize this would have so much impact on speed!! UPDATE (20160418) : I’m posting this more for posterity, as Stacks continually locked up at both the “ustacks” and “cstacks” stages. These processes would take days to run (on the full 96 samples) and then the processes would become “stuck” (viewed via the top command in OS X). Have moved on to trying PyRAD in the meantime. Need to get the GBS from BGI data analyzed. Installed Stacks (and its dependencies on Hummingbird earlier today). Below is the Jupyter (iPython) notebook I ran to perform this analysis. Getting ready to analyze our Ostrea lurida genotype-by-sequencing data and wanted to use the Stacks software. We have an existing version of Stacks on Hummingbird (the Apple server blade I will be running this analysis on), but I figured I might as well install the latest version (stacks-1.37). Additionally, Stacks requires samtools-0.1.19 to run, which we did NOT have installed. I tracked all of this in the Jupyter (iPython) notebook below. Due to permissions issues during installation, I frequently had to leave the Jupyter notebook to run “sudo” in bash. As such, the notebook is messy, but does outline the necessary steps to get these two programs installed. We received a hard drive from BGI on 20160223 (while I was out on paternity leave) containing the Ostrea lurida GBS data. An overview of this project can be viewed on our GitHub Olympia oyster wiki. The data was generated from paired-end Illumina sequencing, so there are two FASTQ files for each individual. The files were analyzed to create a MD5 checksum, perform read counts, and create a readme (markdown format) file. This was performed in a Jupyter/iPython notebook (see below). IMPORTANT NOTE: The directory where this data is housed was renamed AFTER the Jupyter notebook was run. As such, the directory listed above will not be seen in the Jupyter notebook. An astute observation by Katherine Silliman revealed that the FASTQ files I had moved to our high-throughput sequencing archive on our server Owl, only had two FASTQ files labeled as “undetermined”. Based on the number of lanes we had sequenced, we should have had many more. Turns out that the undetermined FASTQ files that were present in different sub-folders of the Genewiz project data were not uniquely named. Thus, when I moved them over (via a bash script), the undetermined files were continually overwritten, until we were left with only two FASTQ files labeled as undetermined. I also zipped up the raw data project from Genewiz and moved it to the same archive location and updated the checksum.md5 and readme.md files. Details can be found in the Jupyter (iPython) notebook below.